GDP growth in Slovakia has been largely the result of a revival in external demand supported by improved competitiveness. Apart from the depreciation of the Slovak currency (i.e. 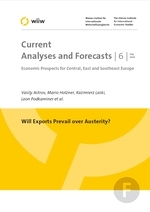 the euro), the export expansion has been driven by a strong fall in unit labour costs coupled with rising labour productivity and falling producer prices. An increase in the unemployment rate to an average level of 15% (LFS) is the shadow side of those developments. If the euro remains weak and ULCs low, GDP growth may expand by above 3% in 2010. The main challenges for the new government relate to rising unemployment and the escalating general government budget deficit (about 7% of GDP in 2010).